The 14th of April is when the Prisoners’ Day is commemorated. It’s a day that Eritreans remember their prisoners to spread awareness of the plight of their loved ones, and they remember so many of them. Some who grew old in the dungeons of the cruel Eritrean regime, others rumored to have died in captivity, still others who are suffering from serious illness, lost a limb, eyesight or something else. But they all lost the most vital thing in life: Freedom. I hesitated to write this edition of Negarit which I thought of dedicating to the prisoners. I am not fond of poster boy publicity, but when I thought of writing something about the prisoners, I couldn’t possibly write about all the human aspects of the prisoners, or my personal memories with many of them. I couldn’t write about the people I knew when they were much younger than me, and who have now disappeared in the regime’s prisons. I couldn’t write about people I looked up to and who have disappeared in dungeons. I couldn’t write about those I heard were buried in the prison ground in total silence. I couldn’t write about the many teachers who disappeared in Keren soon after the independence of Eritrea—many of them went to a school in the same block I grew up. I knew several who hailed from Betjuk, where I was stationed for a lengthy period during the struggle era, and with whom I developed almost familial ties—I knew their parents, their communities and saw them growing up in that generous community. I couldn’t also write about Am Abdulrahman Younis, the nonagenarian who treated me like his friend, like his peer, and who shared taboo jokes with me, and who told me stories about old Keren that is now a knowledge I own. I could write about Abdulaziz Neberai, the brother of the martyr Beshir Neberay, my closest childhood friend. He was snatched from his bed over twenty years ago never to be seen again. I could write about many others whom I knew through the thin and thick of the struggle era, but they are too many. 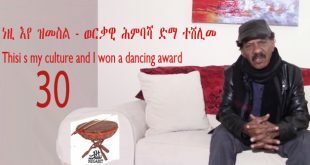 That is why I settled for writing a representative story, and I chose to write about Mohammed Mranet, the man in whose hands I was initiated to join the organized Eritrean struggle. Unfortunately, I never met Mranet again since we met in his hut in Ad-Habab some forty-years ago. Mranet is from Betjuk, but when I was there, he was arrested by the Derg and was languishing in jail. Ironically, he was jailed by the Derg for being a patriot, and now he is jailed by the PDFJ, who were supposed to assure his freedom, but instead they imprisoned him in worse conditions than the Derg, for since Juy 17, 1991, for 27 years, and they have made him disappear. They stripped him of his freedom, and they probably murdered him. I tried to immortalize Mohammed Mranet in my book, “Of Kings and Bandits”, through the character name Osman. In this Negarit edition, I decided to disclose his real name, Mranet. 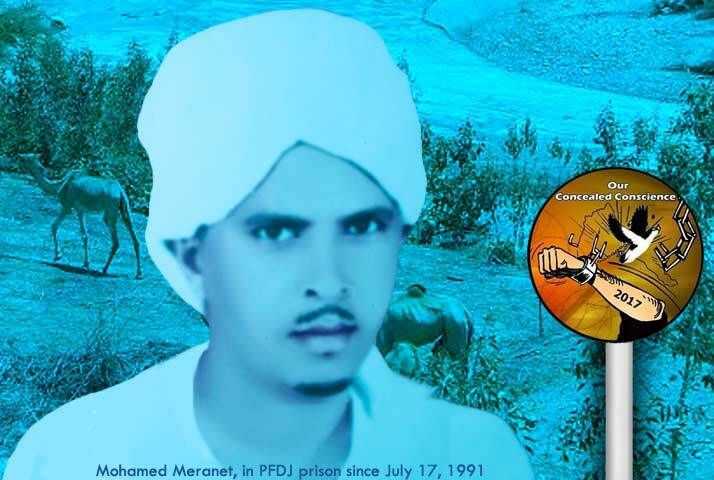 Mohammed Mranet was a judge who was imprisoned by the PFDJ in the early 1990s and made to disappear in their dungeons, nothing was heard about him to this day. Below is a part of the story from my book “Of Kings and Bandits”; I revised it to reflect his real name: Mohammed Mranet. ….Jemal never thought of the swirls when he threw pebbles into the Shfshfi Lake. He believed the river would carry his pebbles miles away to some bank, or maybe over time dissolve in the water like grains of sugar in a hot cup of tea. He never thought of the ripples and its silent swirl as a forecast of the future of his generation being pushed out. For a while he dreamed of growing up, aspiring to become a professional, to have a family of his own. But his generation stopped dreaming the moment it learned to have them and if they did, they were extremely short dreams that didn’t go beyond the present—Janhoi seemed to own their future. Only those who joined the rebellion could own their dream. The moment they joined the rebellion, they became role models and celebrities and made the young feel jealous. They visualized the older boys armed with kalashnikov guns, clad in khaki shorts and shirts, avenging the helpless civilians who were abused too much, for too long. They were convinced beyond any doubt the Jebha rebellion was a noble and selfless resistance—a cause worth living and dying for. Jemal was eager to grow up, quick! The summer he finished seventh grade, his voice got huskier. Thanks to Am Raki, the circumciser, he had become an adult two years earlier. He heard of secret cells that operated among the students to support the rebellion and wanted to be part of the big cause. Ahmed the shopkeeper had smiled in a way that assured Jemal he would help him realize his wish of becoming part of the rebellion. “Friday,” he had said without explaining further. On a Friday afternoon, Jemal walked with Ahmed to the Ad-Habab area on the edge of town and arrived at a small creek, where a man sitting by the side stood up the moment he saw them. Jemal remembered him, Mranet, the man to whom Bakri and his friends handed wads of money. They shook hands with Mranet and then he led them up the edge of a hill to a hut whose doors opened towards the creek. Ahmed introduced Jemal: “He wants to be part of the struggle,” he told Mranet. “Excellent. Excellent,” he said looking at Jemal seriously. Mranet asked Jemal to choose a secret identification number. “Any number that you can remember,” he said. Jemal remembered his sixth-grade student ID number: 471. Mranet noted it in a small notebook and asked Jemal how much he would afford to contribute. Qerrab, 25 cents, a month, Jemal had said. The tense wrinkles on Mranet’s face were now relaxed. He repeated the same warning, about secrecy and loyalty to the cause, before he stood up and walked towards the door. It was a sign that they had to leave. “Ahmed is your contact,” Mranet had said before shaking hands as he saw them out. 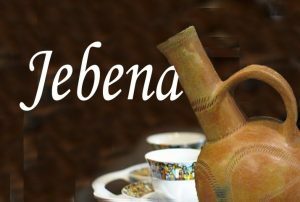 Jemal became a member of a clandestine cell of Jebha, he felt like a real man; but he didn’t know he had bid his childhood goodbye. He had the urge to talk to Mranet about Degiat but he didn’t. He remembered that as a new-recruit, he is supposed to begin walking before he can run. Jemal felt like a man: circumcised, thanks to Am Raki, and a member of the rebellion, thanks to Ahmed and Mranet. His teeth that had embarrassed him for too long had filled in. He felt a man on all counts. Jemal touched his teeth—both had fully grown back, thanks to Dr. Ahdeh. Bakri had taken Jemal to Dr. Ahdeh’s clinic when his top incisors refused to grow after he lost them as a child. For years, he had suffered waiting for his teeth to show. They didn’t. Jemal resisted smiling because children ridiculed him for his sheraf, window-teeth. It was even more embarrassing around girls, at a time Jemal yearned to be an adult and tried hard to act like one, finding it impossible to act older with missing teeth. Bakri recognized his anxiety and Jemal ended up in a chair in Dr. Ahdeh’s clinic, in a building across the Grand Cathedral in Asmera. The X-ray showed that two extra teeth inside the gums blocked the incisor teeth from growing. Ahdeh had extracted the hindering teeth and assured Jemal his teeth would grow in a few weeks time. They did. Jemal liked Dr. Ahdeh and thought of him as the best doctor in the whole world. Whenever he visited Asmera, Jemal made sure to visit his clinic; it was almost a ritual. Earlier, a relative had suggested that Jemal visit Mubarek, the healer, “Maybe the devil is blocking your teeth,” he had told Jemal. Everyone in the town knew that Mubarek the healer controlled jinnis and treated patients with mental problems. “I am not insane, it is just my teeth,” Jemal had protested. “Believe me, it is the devil,” the relative had said. Sick people from all over the country flocked to Mubarek for treatment with a mixture of roots and herbs—and prayers. If that didn’t work, a serious type of treatment followed—he knew how to deal with evil spirits that caused most sicknesses. Mubarek whipped and slapped insane people until the unruly jinnis that possessed them came to their senses; most calmed down after a slap or two when the jinni could not bear the pain anymore. A car once brought an Italian man from Asmera to be treated by Mubarek. The uncombed man sat in the middle of the backseat restrained by two men sitting on his sides. Jemal never thought Italians could become insane until then. After a few weeks of treatment the condition of the Italian patient must have improved. Mubarek allowed him to roam the streets and the man went straight to a grain mill, jumped into its engine pit, and began to toy with the machine. He had refused to get out until a muscular butcher who happened to pass by jumped into the pit, carried the man out like a sack of grain, and took him back to Mubarek. The healer beat him up so hard the man fell down to the ground and begged for mercy. “Why did you make him do that, why did you put his life at risk?” Mubarek shouted. The man stuttered and spoke gibberish; some people thought it was the jinni speaking in tongues. “Leave him alone,” Mubarek shouted. The jinni didn’t reply, but the patient wept and pleaded for mercy. Mubarek brought a chain, tied the man’s hands with it, secured it with a padlock, and led him to a room like a dog on a leash. The patient followed obediently. Jemal was happy he didn’t heed his relative’s advice. He was thankful to Bakri for taking him to Dr. Ahdeh the dentist. What is the significance of April 14? The extra-judicial arrest and disappearance of Eritreans started immediately after independence day. For instance, Mohammed Mranet about whom I wrote the article, as a sample of the prisoners was arrested on July 17, 1991–barely two months after independence. 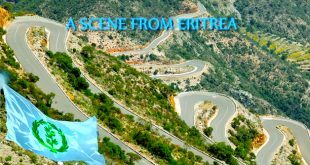 At that time, due to the euphoria of independence, many Eritreans never paid attention to what was happening away from their sight. And the arresting continued un-abetted and wouldn’t stop. Prisoners were not brought to a court of law and every security officer seemed to have the authority to decide on the lives of citizens, whatever they were accused of. 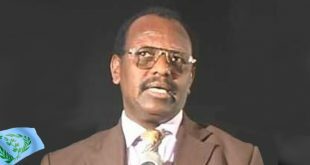 In April 14, 1992, a horrible wholesale arrest was carried by the PFDJ. 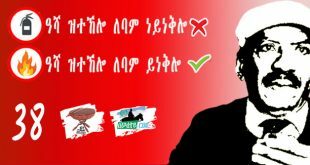 It touched citizens in all parts of Eritrea. Wholesale arrest of teachers from all area, from Senafe to Tessenei to Sahil terrorized the population. 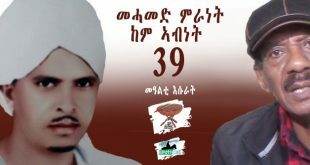 A few years ago a group of activists, including children of many of the arrests citizens, initiated an event to commemorate the Eritreans prisoners. And since last year, activists in London took charge and now it is an established day in which anyone who cares about freedom, rule of law and justice should participate. Thank you for the question and I hope I explained it enough. Selam Saleh Johar, thanks for the clarification. 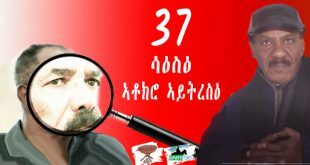 In fact the truth is that the EPLF never trasitioned itself from the guerilla days of doing business when it arrived in Asmara on May 1991. In the field, many tegadelties where marshaled to the notorious Halewa Sewra without due process of law, or through the process of the sort of kangaroo court, or the infamous neqefieta-nebse neqefeta/ criticism-self-criticism style of primitive jungle ‘cout hearings’. In those early years of independence, yes, you’re right the great majority of the people were intoxicated by the great victory of driving out the foreign occupiers against all odds. And hence, we were not paying much attention to the ways the EPLF leaders were conducting themselves; and worse, we were looking the other way when a number of our compatriots, even the liberation war disabled tegadelties were summarily shot, were made to disappear or incarcerated without due process of law. Unfortunately, our indifference and blind trust of the EPLF leaders then has come to haunt us to this day, and we are paying a very dare price for our uncritical way of thinking and herd-mentality. Yes, you’ve answered it in general terms. Thanks. I will now go technical. It certainly makes sense then if it indeed was a day where one of the largest arrests were made. If there is reference material, I would love to learn more about the events of this day. Having said that, can a group of citizens take upon themselves to declare a national day? By that, I mean their intention, I assume, is for all Eritreans to observe the day, regardless of where they may be or what political aisle they belong to. As I see it, national occasions can be observed in one of two ways. 1) Official State declaration (in this case, obviously PFDJ won’t be interested on having prisoners’ day). 2) International convention, such as March 8 and other dates. You are right, the PFDJ is the enemy and cannot help decide the day its victims are remmemberd. In the absence of a government that bonds the people together, people do what they think is right. If the organizers asked the public to help them decide, you know the next century will be here before they reach to an agreement. Consensus is fine, but it shouldn’t be a reason for paralysis. Some concerned Eritreans took the initiative and they are doing fine. I see no reason for indulging in moot discussions because any day of the year is like another. April 14 it is, I have no problem with it. 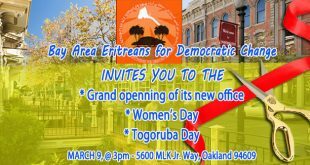 But if Eritrea is free, maybe the day will be changed to “Justice Day” to spread awareness about freedom and liberty. I will spare my nearly Two decades long in the Trenches of the proverbial Abu Ashera btSAy Berhe Y …. And it is The Sacred Day of The Redesmer. Observance of protocols such as declaration of war and rule of engagement as well as the observance of a Temporary Cease Fire for the observance of prayor and Sacred Holidays …. ..
greetings and a sincere thank you for sharing this. Remembering our prisoners is one of the most important things we should do in the struggle for human dignity in our society. When a person who has been in direct contact with one of those prisoners shares information and memories, it’s like adding some important lines to the chapters of our common history. Reading your article, I have a couple of questions about something that I don’t know and I would appreciate it if you could share what you know about it. Does the date of April 14 represent a particular date in our history and how and when was it chosen to commemorate Prisoners Day? Thanks in advance for any inforrmation. Today, on this special day, I have a message of Reconciliation. I hate generalization. For this reason, I have directed my message to four outstanding Human Rights Activists and Defenders to avoid their differences and be a united voice of the voiceless people. For the last four years I have seen and witnessed a divided actions. My call is to bring all these voices in one. Selam tes, your hyperlink is not active, just you know that. Abi, I guess tes is trying to direct us to some exernal information/message that he wishes to portray. Probably to his blog? Thanks. It is now active. Very timely. I felt like the article was accidentally made stop. I also thought some more info as epilogue about his later life and the circumstances of his arrest would have helped us absorb Mranet, the man more. And the book has more on this but nontheless, it is a nice timely scoop of history of our people. 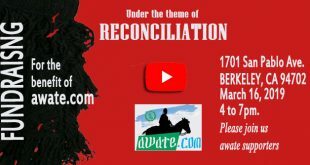 What kind of Kerenite would be interested to write about a 6th century Abreha of Adulis while being indifferent to heroes of his village deprived of their life in independent Eritrea?!! Kerenites are the symbol of resistance and boldness in the Eritrean history. Kernites object any kind of justice and oppression. Ghezeb is an aberration of personality from the character that define the Kerenites. There are many like him in every community. Hence no surprise on his act to ramble without definite purpose against the public’s interest. Some how other cities people or let just tell the way you want it that other ethnic are fun of oppression when it was put upon them right? ? This is why you guys always fell, you guys have no long term vision than trying to divide our people. 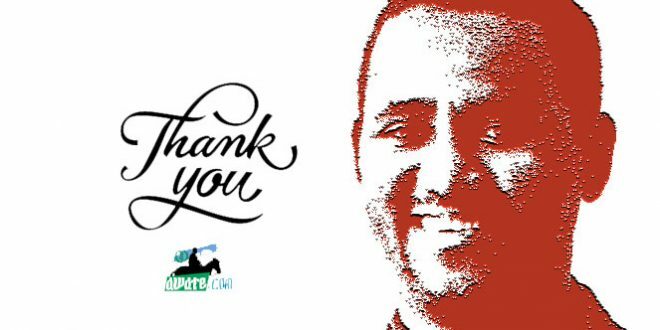 Thank you for this beautiful tribute to the prisoners. 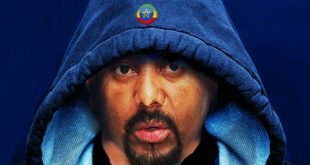 The day you remiንded us of this day a week or so ago I had promised myself to prepare a 2 cent poem. That is what I can do for now. Brilliant. It is uplifting when one lives among those who are empty and have no compassion. Eritreans who cheer for the oppressors of their people and for the slaughtering of justice. Crimes that Eritreans paid dearly rid themselves from. It is not good to wish any Eritrean bad (except the PFDJ and its tiny cliques) but there is only one thing humanity learned from the Indian culture, it has to be Karma. I have come to believe it really catches up. See what time does to us? See where the cruelty has reached–honestly I couldn’t tell between the two brother, Abdulaziz and Abdulrazaq. To me they are part of Beshir, my dearest friend who left too young, paid with his life for a just and noble cause, with his head high up, and bled for the right of his people, like many of his peers and elders. 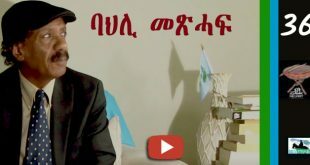 A payment that the very young who were supposed to enjoy the fruits of freedom are still paying, many of them in between the dead and the living, in the dungeons of the PFDJ. 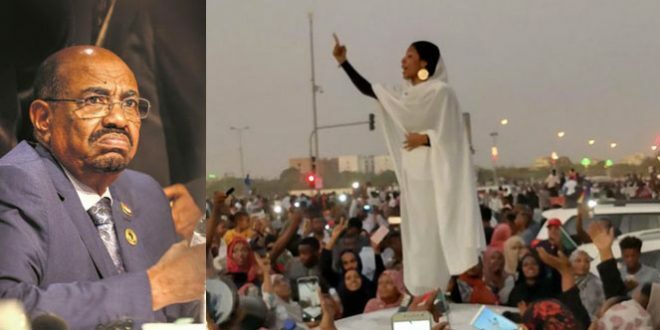 To the extent that they are disillusioned about the entire journey, when those who were supposed to be liberators turned to be oppressors, when those who were supposed to be the keepers of the Eritrean legacy are squandering the the essence of nationhood. This brave , selfless and freshly circumcised boy who goes by the name Jemal must be the same Jemal who witnessed the Ona incident in the novel “Miriam Was Here”. Haha..the dots are too many to miss. Jamal might be more than a book character. Jemal went from Keren and met Mranet at his tender age, at AdiHabab inside his hat. That was how Jamal joined the struggle. Young Saleh met Mranet 40 yrs ago at AdiHabab in his hat and was initiated to join the struggle. Saleh’s id number was 174. Jamal’s was 471. I appreciate your acute imaginative mind, how you weave the threads of logics, to give the meanings of the story and it stands for. I agree with your depiction. Always enjoy what you say. It is a delight to read such a complement from a no nonsense and principled guy. You sound like you missed to pay attention to paragraph 4 of the short article. The Author has put it in black and white. Yes, Saleh is Young Jemal. I just wanted to know what Dr Ahdeh did to help young Jemal grow his teeth. He sound like his teeth was late to feel. I think early teenage years. He was also late to be circumcised. Please do not take this comment seriously. It is not important at all. I just took the opportunity to say hello. It is Saturday. The Milan derby is going on. it is crystal clear but we still ask about who witnessed ona and who met mranet because we want to hear more. good curiosity about the teeth growth mystery. but one secret to tell you is kerenites are very resourceful and have a lot to offer to the world. all these suffering from being called toothless by one awatista must know that there is a fix. Thank you for giving me the opportunity to use a patronizing tone: “You Peaople”! !